The new release of Kaseto introduces multiple new comfort features. In the taskbar, the currently played song will be displayed and a mini player will appear in the window preview. There, the playback can be paused and jumped to the previous or next song by just one click. In Kaseto, a click with the right mouse button on an album or song opens the new context menu. 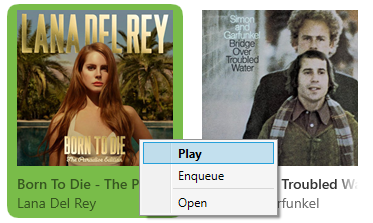 The menu item “Play” starts playback immediately. Via the menu item “Enqueue” an album or song can be inserted at the end of the queue of all music to be played. This means that the playback will start as soon as all other pieces of music have been played. The menu item “Open” is only available for albums and shows all tracks of it. If you want to queue several songs at once, it may be convenient to activate the selection mode by holding the CTRL key. In the selection mode, clicking on an album or song will select it instead of starting to play it. The Shift key can be used to select a bunch of albums and songs at once. This works just like in Explorer. Kaseto detects the language of the operating system when starting and chooses the language automatically. Another language can be chosen in the settings. German, English, French, Greek, Italian and Russian are currently available. Do you miss your language? Then help us translate Kaseto into your language. Just drop us a note and we will send you the translation template.